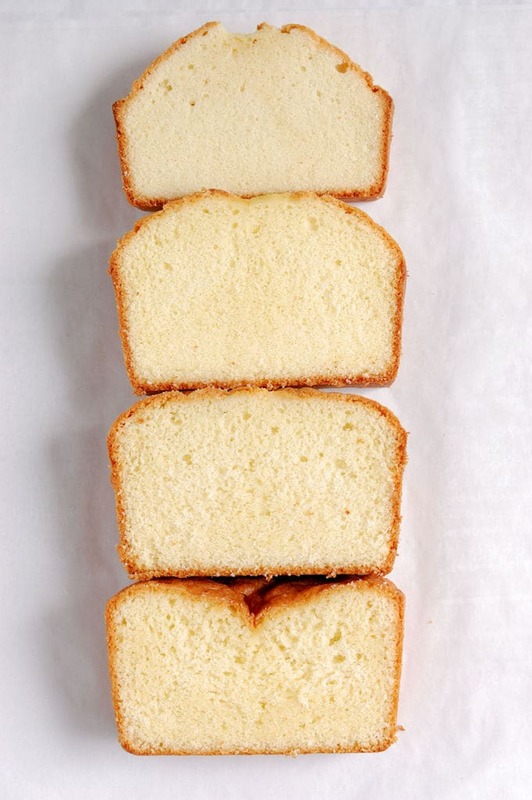 In the first Cake Batter class we started the process of taking apart and examining the original pound cake recipe. Now we’ll learn about an important ingredient in cake batter, salt & leaveners. What’s a leavener? That’s just a name for baking powder and baking soda. They’re used in small amounts, but have a big impact. The testing for the “mixing methods” class adhered strictly to the traditional “quatre-quarts” recipe of equal parts butter, sugar, flour and eggs. 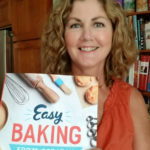 The remaining classes in the Cake Batter series will examine each of those ingredients and their respective roles in the recipe. Neither salt nor leaveners are a part of the basic pound cake formula. I thought the cakes I baked for the mixing methods tests, which used the original recipe, were a little dense and tasted a bit flat. Now we’ll explore how the addition of salt and chemical leaveners can improve the original pound cake. These two ingredients are used in very small measure, but have a major impact on both the flavor and the texture of the cake. I baked 9 pound cakes to test the effects of salt and baking powder, with wildly varying results. Lots of pound cakes were baked to test salt and leavener amounts. 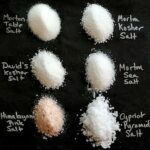 To learn general information about the types of salt and how they work in baking, please visit the Baking Ingredients – Salt post. This class will specifically cover how salt works in pound cake batter. 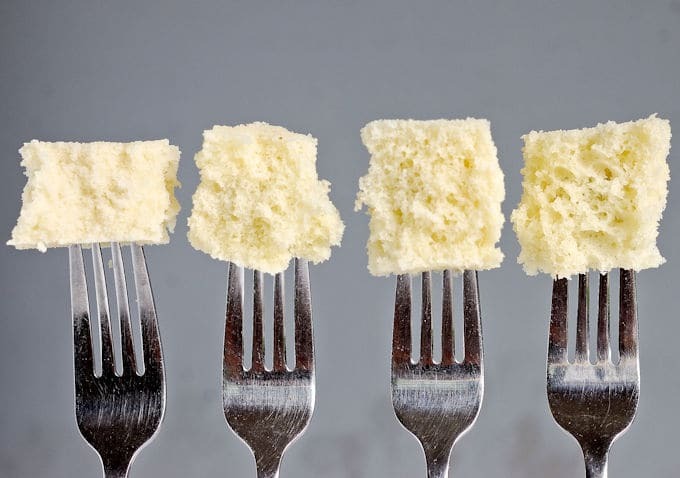 A ½ teaspoon less or more of salt may not make much difference in a pot of soup, but it can make a great deal of difference in cake batter. 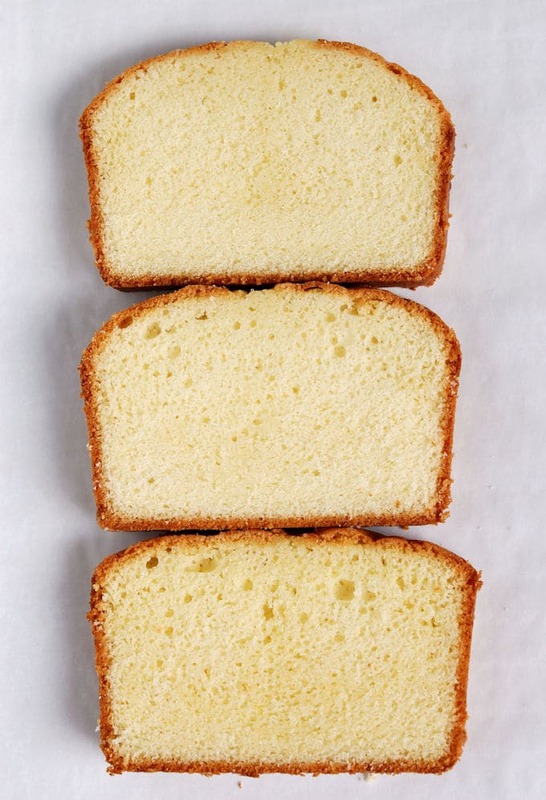 My testing proved that, for our pound cake recipe, a little salt goes a long way. As I discuss in the Baking Ingredients Class, Salt is not only a flavor enhancer. Salt also affects the tenderness of a baked good. 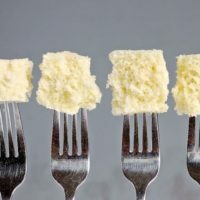 Salt molecules form strong bonds with flour proteins, causing the gluten molecules to become less mobile, which, in turn, makes the batter tighter and more elastic. This is a desirable trait in a bread dough, but is definitely not desirable in a cake batter. 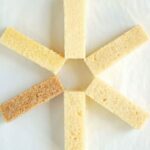 I baked several cakes to test how salt changes the pound cake’s flavor and texture. All the cakes were made with room temperature ingredients and were baked in identical 9×5 loaf pans at 325°F in a convection oven. 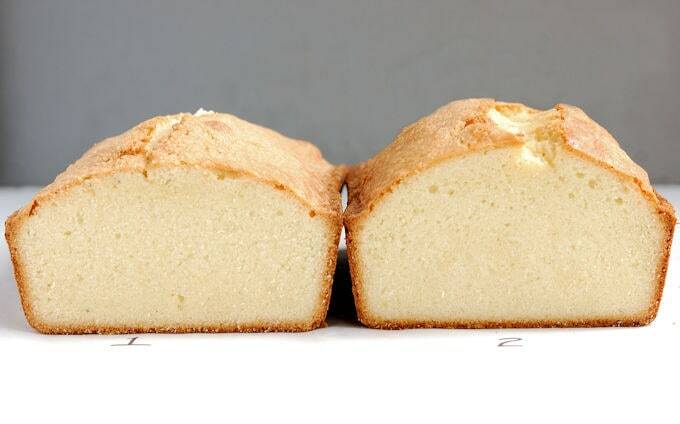 As a control, I first baked a pound cake using only the four original ingredients and the reverse creaming method. Consistent with previous tests, the cake was fairly dense with a soft tender crumb and a slightly flat taste. For the next test I added a ½ teaspoon of table salt to the batter. The difference between the first and second cakes was really surprising. The cake with the added salt baked up higher due to the stronger gluten in the batter, and had a noticeably more chewy bite. The flavor was better than the first cake, less flat and more well-rounded, but the loss of tenderness was not good. I reduced the amount of salt to ¼ teaspoon for the third test. I found that was just enough salt to improve the flavor, yet keep the tenderness of crumb. Now that we have just the right amount of salt in the cake, we can move on to leaveners. The cake on the left has no salt and the cake on the right has 1/2 teaspoon of salt. The salt made the cake rise higher and have a tougher texture. 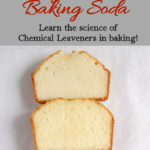 Please visit the Baking Ingredients – Chemical Leaveners page to learn all about the science of baking soda and baking powder. This class will discuss the specific effects that chemical leaveners have on cake batter. 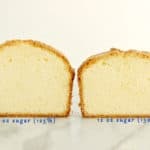 Based on the rule that 1 teaspoon of baking powder creates enough lift for each cup of flour in the batter, the correct amount of baking powder for our pound cake recipe should be about 1 ¾ teaspoons baking powder. 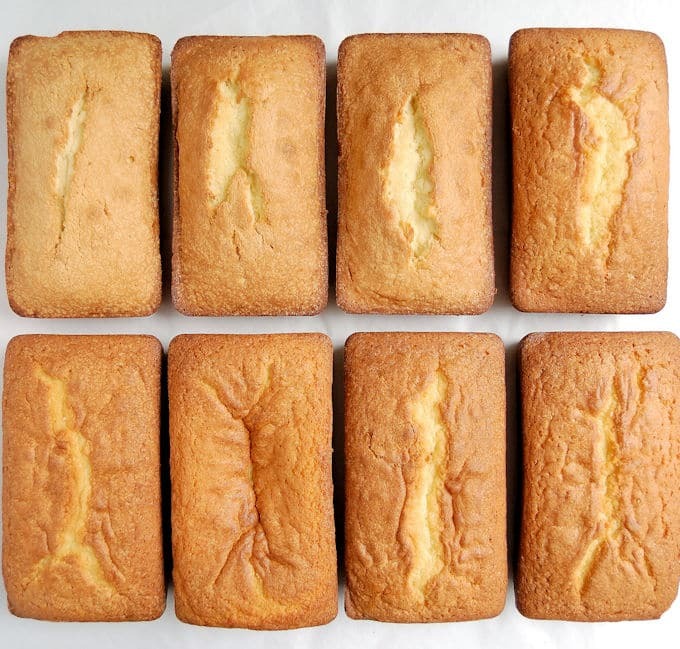 To test the ideal amount of leavening for our pound cake, I baked 3 successive cakes, using 1 teaspoon, 2 teaspoons and 3 teaspoons of baking powder. The difference between the three cakes was quite striking. The cake made with 1 teaspoon of baking powder was nicely domed with a slightly open crumb. The cake made with 2 teaspoons of baking powder had a lighter, more open crumb and started to flatten a bit at the top, but it was still acceptable. The cake made with 3 teaspoons of baking powder collapsed down the middle because the batter could not hold the excess carbon dioxide. The crumb on cake 3 was rough and spongy. 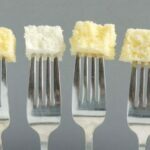 Of the three cakes, I preferred the one made with 1 teaspoon of baking powder. It had a little lightness from the leavener, but retained the traditional pound cake texture. The same pound cake recipe made with gradually more baking powder. Too much leavener caused the last cake to collapse. But wait, there’s more. How the leavener is mixed into the batter can make a great deal of difference in the final product. It may be hard to believe, but there is yet another factor to consider regarding chemical leaveners. 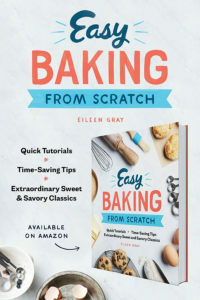 Leavening that is not thoroughly and evenly distributed through the batter will result in a cake with an uneven crumb and scattered tunnels and holes. You may even get an unpleasant bite of raw baking powder. For the final round of tests I mixed 1 teaspoon of baking powder into the batter in 3 different ways. For the first cake I sifted the baking powder with the flour and then mixed the sifted ingredients together on low speed for a full 20-30 seconds before adding the butter. For the second test I sifted, but did not take the time to premix the dry ingredients before adding the butter. For the third cake I did not sift or premix the dry ingredients. Once again, the difference between the baked cakes was clearly visible even before tasting. The first cake had a nice even crumb, the second cake had a slightly rougher crumb with some holes and the third cake had a rough open crumb with tunnels and holes throughout the cake. Sifting and pre-mixing the leavener is definitely worth the few extra seconds it takes. After 9 test cakes, here is the revised pound cake recipe. It’s not perfect yet, but it’s getting better. A small change to the traditional pound cake recipe (equal weight of flour, sugar, butter and eggs) makes the cake lighter and tastier. Preheat the oven to 350°F. Butter and flour a 9"x5" loaf pan. Combine the eggs and the vanilla in a small bowl, whisk to combine and set aside. Sift together the flour, salt and baking powder. Add the sugar to the flour and mix at low speed for 30 seconds. Add the butter to the flour and mix until combined. Increase the speed to medium high and continue to mix for a full 2-3 minutes. The batter will lighten in color and texture. Scrape the bowl and beater thoroughly. On low speed, add the eggs in 2 increments, scraping the bowl after each addition. Before making any other changes to the basic pound cake, I added a teaspoon of vanilla. 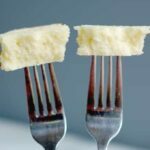 While vanilla is an essential baking ingredient, the addition of vanilla does not noticeably alter the texture of the basic pound cake. Extract can be added without consideration of the balance of the recipe and does not need further examination. In Cake Batter Class #3 we’ll examine that most basic of baking ingredients; flour. When we’re done experimenting with all the techniques and ingredients for this “cake batter” course, we’ll use all we’ve learned to create Pound Cake Perfection. 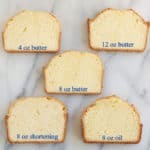 In This comprehensive post about creating a great cake recipe you’ll find the perfected pound cake recipe, and lots of great information to help you adapt and create your own cake recipes. Thanks, Trang. It was a lot of work, but I’m weird and think research is fun! This is pound cake art at its best! Your pictures were also well taken such that you can see the fine details. Thanks! Photography is a work in progress for me. So for my pound cakes they typically ca for 3 c of flour, 3c sugar, etc 1tsp baking powder and salt. But dont rise alot. Should it be 1tsp baking powder per cup? How much salt per baking powder. Hi Keosha. It’s hard to be exact without seeing the entire recipe, but I would say that you need a little more baking powder for a batter with 3 cups of flour. I would try using 2-3 tsp of baking powder and see how that works for you. As far as the salt, I like to use just enough to enhance the flavor of the cake, but not so much that it affects the texture. For 3 cups of flour I would try about 1/2 tsp salt. Love this post!! I just recently made a yellow cupcake recipe that turned out with the texture of corn bread, despite being careful not to overmix. After reading this, I know I didn’t distribute the leavener in the dry ingredients enough! Also, the recipe called for 1/8tsp of baking soda to offset a scant 2 tsp of buttermilk… From this post and the baking ingredient class, it seems that’s way too much. Could I just omit it all together and adjust the baking powder to do the lifting of the flour? About 1/2 tsp for 1/2 cup right? Thanks, Sarah. I’m so glad the post is helpful. Yes, if the only acidic ingredient in the batter is 2 tsp of buttermilk I would just use baking powder. A 1/2 tsp of baking powder for a 1/2 cup of flour is a good amount. If you are a member of Facebook, I have a private Facebook group where we discuss questions exactly like this one. It’s called Baking Sense-Recipe Workshop. If you join the group you can post the recipe you’re working with and we can try and troubleshoot it for you. Let me know how the changes work. I have read this post with much interest as I am making my the wedding cake for my daughter. The cake is to be a lemon buttermilk, using fresh lemon juice. The recipes I have looked at use various amounts of either both baking powder /soda or just baking powder, it is very confusing. The recipe uses 375gr of AP flour which is listed as 3 cups 1/2 teaspoon each of baking powder and soda, 240 mls buttermilk and 60 mls lemon. Another recipe uses identical ingredients apart from using only baking powder, 1 tblsp which I understand is 3 teasp in the US. Will the tangy flavour of the buttermilk be lost using baking soda? Does that amount of acid require the use of some baking soda? Will b powder alone be enough to offset any ‘sourness’ from the acids while providing enough leavening for the flour. Could you make any suggestions on which is the best combination to get a moist flavoursome light cake? Thanks for any assistance you are able to provide. Hi Jerrie, Did you also read the Baking Ingredients post about chemical leaveners? There is more information that might be helpful. Personally, when I want a lemon flavored cake I prefer to use lemon zest and lemon extract rather than lemon juice. Lemon juice is acidic, but lemon zest has much better lemon flavor because of the oil in the skin. Based on a recipe with 3 cups of flour, you would typically need about a tablespoon (3 teaspoons) of baking powder. A 1/4 teaspoon of baking soda has the same lift as 1 teaspoon of baking powder. A 1/4 teaspoon of baking soda will also neutralize the acid in 1 cup of buttermilk. Read the post in the link above to learn more about how much leavening to use to make your own judgement. But for a recipe with 3 cups of flour and about a cup of buttermilk I would use either a tablespoon of baking powder and no baking soda to keep a little of the buttermilk tang or 2 teaspoons of baking powder and a 1/4 teaspoon of baking soda to neutralize the acid in the buttermilk. If you add the lemon juice you could use 1 teaspoon of baking powder and 1/2 teaspoon of baking soda. Thanks very much for your advice. Could you please indulge me with more of your time and knowledge, it was reading the linked post that prompted my query. Other posts have intimated, or at least I interpreted as meaning, if an acid is used then, baking soda is needed, whereas now my understanding is, if baking soda is used then acid needs to be used also, is that the correct way round? If baking powder alone can be used to leaven when acid is included, it appears the soda is not required for leavening. I understand that if included the b soda does leaven but will also neutralize the acids. Does this mean it negates the flavour of and tenderising effects of the buttermilk and lemon juice? What is the benefit of using baking soda, is there a level of aciditic ingredients at which baking soda should be used either alone, or in conjunction with baking powder, depending on the amount of flour?
. Yes, this is correct. If you use baking soda without an acid the batter will be too alkaline and will have a soapy taste. I have made recipes using an acidic ingredient and no baking soda (just baking powder) with good results. You still get the benefits of the acid as far as tenderizing and flavor whether you use soda or powder for leavening. The main takeaway is that baking soda needs an acid to react with to produce carbon dioxide for leavening. Why would you ever use baking soda then? Well, acidic batters/doughs don’t brown as well so using baking soda with an acidic ingredient does improve the browning. Generally, for cakes I don’t want too much browning anyway, but for cookies I do. Jerrie-if you like these kinds of questions/answers I suggest you ask to join my Baking Sense Recipe Workshop group on Facebook. This is exactly the kind of thing we like to discuss. Just ask to join and I’ll add you to the group. Thank you so much for your valuable advice and your time, hopefully the wedding cake will be a success. I am very interested in joining your Facebook group. Wow I have been looking for such research!!! What about 7 up cake can I still add the baking powder with the 7-up….my pound cakes have been good but a little heavy please advise…thanks!!! Well, I haven’t worked with 7-up, but I imagine it’s just more liquid. Why thank you! That’s so nice to hear. I worked really hard on the series.